Zyro, the UK’s largest privately owned cycling distributor, has announced significant year-on-year sales increases for both the Bell and Giro Cycling brands in the UK market. The distributor said that sales for Bell Helmets have doubled year to date, with retailers reporting particularly strong sales of the brands high end helmets. Zyro pinpointed the new Super 2 and Super 2R helmets, as well as investment in MIPS technology, as key drivers of the Bell business, as well as new models like the Overdrive and Star Pro – which have bolstered Bell’s road offering with aero performance. Zyro added that models like Event have "redefined the £50 price point". 2014 saw the launch of the ‘Bell Ride Free Days’ to promote the brand at a grass roots level and these will continue for 2015. 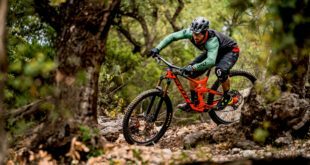 The brand has also made significant moves to support British athletes at the highest level, with UK riders representing Bell helmets; including Atherton Racing, Danny Hart, and the UK based Orange Dirt world team. Zyro said: "With such a rich brand heritage and the best technical minds in the business, Bell has shown that they can produce a range of helmets that allow retailers to offer their customers a legitimate reason to upgrade or invest in a new helmet." Zyro added that Giro sales have more than doubled year to date as well. The Giro Empire and Empire SLX shoes have been pivotal in Giro’s performance, Zyro revealed. Worn by the likes of Taylor Phinney and Sir Bradley Wiggins, the Empire has reached cult status, the firm said: "Retailers have been able to offer their customers a truly a desirable footwear offering, driving customers into store. Not to be outdone by the high end shoes, the response to the Rumble and Petra shoe models has been phenomenal, with retailers seeing great sell through. "With Giro retailers not only benefiting from a comprehensive range of products, that feature industry leading innovation and performance, but also from products that consumers consider highly desirable and are actively seeking out at retail." Helmets remain a key category for the brand too, with the new Synthe helmet, the Foray and Saga all named singled out.